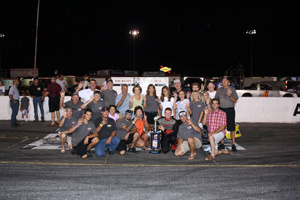 ( Newton, NC - - September 18, 2010 ) It was an amazing and memorable night of racing at America's Most Famous Short Track, Hickory Motor Speedway, as the track hosted AT&T Championship Night presented by Gaston Rentals. The Speedway headed into the night with only two of the six NASCAR Whelen All-American Series Division Champions determined, the No. 5 of Dexter Canipe Jr. in the Advance Auto Parts Limited Late Models and the No. 4 of Adam Beaver in the Hickory 4-Cylinders. 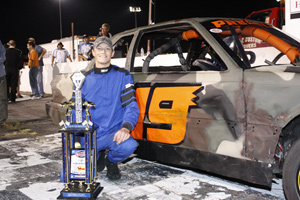 The Championship battles in the remaining four divisions were intense, with a separation as small as six points between first and second place in the Everything Attachment Super Trucks.  The main battle to watch was the one between the No. 10 of Andy Mercer and the No. 88 of Kyle Mansch in the Bojangles Late Models, with Mansch a mere 20 points behind the front runner, Mercer. The Bojangles Late Models took to the track knowing this final 100-lap feature would be the deciding factor as to which driver would be crowned Hickory Motor Speedway Track Champion in the eyes of the fans and NASCAR. The No. 10 of Andy Mercer knew by the car count he would only need to start the race to clinch the points championship, lining up to start the feature in the fourth place position. The No. 43 of Jesse LeFevers led the field to the green flag staying out front for the first six laps, until the No. 5 of Dexter Canipe Jr. took over the lead on lap seven. The No. 88 of Kyle Mansch worked his way up towards the front of the field pulling under Canipe Jr. on lap 25 looking for an opportunity to move into the top spot, taking over the position on lap 36. Canipe Jr. was eager to pull back out front as he and Mansch ran door to door. On lap 41 the two headed into turn four side by side and connected sending both cars for a spin on the front stretch bringing out the first caution of the feature. On lap 42 LeFevers regained the lead with the No. 51 of Josh Wimbish and the No. 92 of Candace Muzny trailing behind in second and third. Caution number two fell on lap 49 after Mercer went for a spin heading into turn four. By lap 50 Mansch had worked his way back into the top three, taking over second on lap 52. On lap 52 the third caution fell when the No. 45 of Jeff Stankiewicz went for a spin in turn two. At the restart Wimbish and Mansch connected as the field headed into turn three, sending Mansch for spin collecting the No. 4 of Katie Hagar and the No. 1 of Jason Romero and bringing out caution number four. The red flag waved as the safety crew worked to clean up the wrecked cars on the track. LeFevers was back in the lead at the restart but Muzny held tight to his bumper, with Muzny taking over the top spot on lap 56. Muzny's lead wouldn't last long after her and LeFevers connected heading into turn two, sending Muzny spinning and bringing out the fifth caution of the feature. Wimbish again found himself out front as the field went back to green flag racing. The sixth caution fell on lap 60 after Hagar went for a spin heading into turn four. Mercer continued to work his way towards the front capturing the lead on lap 65. The seventh caution fell on lap 67 when LeFevers connected with Hagar, sending Hagar spinning as they headed out of turn four. The eighth and final caution waved on lap 69 after Hagar and Romero touched heading down the front stretch putting Hagar into the inside wall. As the field headed back to green flag racing, Wimbish jumped into the lead on lap 70 but his run wouldn't last as Mercer pulled back out front on lap 71. Mercer led the final 29 green flag laps with Wimbish following behind in second. Muzny, LeFevers and Romero would round out the top five. The No. 5 of Dexter Canipe Jr. headed into the final Advance Auto Parts Limited Late Model 50-lap event knowing he had the championship wrapped up. Canipe Jr. brought the 15 car field to the green, but his run out front wouldn't last long as the No. 12m of Austin McDaniel would take over the top spot on the first lap. McDaniel put on a clinic as he began to pull away from the field after he stepped out front. Within the first ten laps the No. 8 of Mark McIntosh made his way into the second place position leaving Canipe Jr. to ride around in third. Third place didn't sit well with Canipe Jr. as he pulled to the inside of McIntosh heading into turn three moving back into second on lap 19. McDaniel continued to power on creating a full straight away lead over the field by the half way point of the race. On lap 27 the No. 26 of Joey Herques had worked his way into the fourth place position. With five laps remaining Herques kept his nose glued to the back bumper of McIntosh hunting for a chance to bring home a podium finish. Herques worked his way into the third place position on lap 33. Just as McDaniel brought his ride across the finish line the No. 11 of Matt Piercy made contact with the No. 66 Travis Byrd causing Byrd to spin around on the front stretch. McDaniel had already brought the race to an end, so no caution waved. Canipre Jr., Herques, the No. 07 of Tyler Chruch and McIntosh finished second through fifth respectively. The tightest points battle heading into Championship Night was the one between the No. 16 of Clint Fields and the No. 11 of Thomas Beane in the Everything Attachment Super Trucks. The two headed into the final 35-lap race with only a six point separation. Fields captured his tenth pole position of the season allowing him to bring the field to the green flag. Beane didn't have the start he was hoping for as he spun the tires causing him to fall to the back of the pack early on. Field's lead wouldn't last long as the No. 6 of Brandon Setzer moved out front on the second lap. The first caution fell on lap eight when the No. 7 of Justin Crider tapped the No. 09 of James Kirkham, sending Kirkham for a spin as the two headed out of turn two. Caution number two quickly followed when the No. 6 of Doug Setzer went for a spin coming out of turn four on lap 11. Beane may not have experienced the best start at the beginning of the race, but he charged on and worked his way towards the front breaking into the top three by lap 25. Just as Beane secured the third place position he and the No. 69 of Trevor Hignutt connected heading into turn two sending Hignutt for a spin, bringing out the third caution. With ten laps to go Beane rallied back working his way into the top five. The fourth and final caution fell on lap 31 after the No. 33 of Jeremy Birch went for a spin on the back stretch. 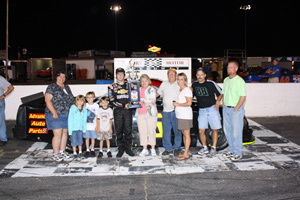 B. Setzer led the final four laps grabbing his first win of the 2010 season. 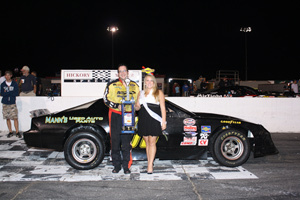 Fields came home second allowing him to capture the 2010 Everything Attachment Super Truck Championship. Beane was able to break into the top three on the final lap leaving D. Setzer and Crider to finish out the top five. The action during the Hickory Street Stock 30-lap race was intense as a battle for the second place position in points was in progress during the final race between the No. 21 of Roger Pitts II and the No. 1 of Taylor Stricklin. The first caution fell just as the field went green flag racing after track officials deemed a false start. The No. 69 of Trey Buff went for a spin on the front stretch bringing out the second caution on lap nine. The third caution waved during the restart after track officials determined Pitts II had caused a false restart. The No. 9 of Charlie Watson took over the second place position on lap 10 pushing Stricklin back to third. Watson wouldn't last long in the second place spot, as Stricklin moved back into the spot on lap 13. Buff found himself going for another spin on the front stretch on lap 13, causing the second caution to fly. The fifth caution came out on lap 17 for debris on the track. Watson would move back into second during the restart, but with eight laps remaining Stricklin battled back and sliding under Watson to regain the spot. On lap 23, Buff went for his third and final spin on the front stretching bringing out the sixth caution of the race. During the final lap, Stricklin took the lead from Pitts II as they headed down the back stretch. The two connected heading into turn four sending Stricklin for a spin bringing out the seventh and final caution. A green, white, checkered finish would determine the race. The No. 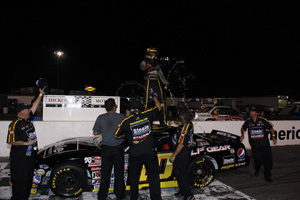 03 of division champion, Kevin Eby led the field through the final laps bringing home his third win of the season. The No. 64 of Marshall Sutton, the No. 54 of Michael Harris, the No. 84 of Jared Broadbent and the No. 22 of Dan Moore rounded out the top five. The Hickory 4-Cylinders hit the track for their 25-lap race with their division champion determined, with the No. 4 of Adam Beaver taking home the top honors. The excitement started early during the race as the first caution fell on the first lap for debris on the track after the No. 07 of Matt Laws made contact with the front stretch outside wall. On lap two the No. 09 of Randy Canipe took over the lead from the No. 18 of pole sitter Devon Haun. The second caution fell on lap four after the No. 59 of Donn Wardo spun around coming out of turn three collecting the No. 6 of Caleb Sisk, the No. 8 of Rob Lewis, the No. 10 of Shane Canipe and the No. 14 of Cameron Lowman. The red flag waved for the track safety crew to clean up the racing surface. The third and final caution fell during the restart after R. Canipe jumped the restart. Within the first five laps the No. 21 of Todd Harrington broke into the top five, continuing his way towards the front moving into the top three by lap 10. On lap 11 Haun made a bold moved as the field headed down the back stretch, shooting to the outside of R. Canipe regaining the lead on lap 12. 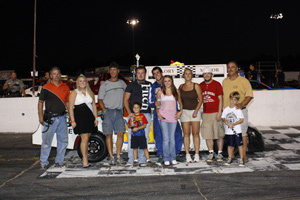 Haun would power on to a second win of the 2010 season. Harrington would follow Haun's lead maneuvering around R. Canipe, bringing home a second place finish leaving R. Canipe to come home third. The No. 86 of Randy Freeze and the No. 3 of Donnie Harmon rounded out the top five. The Red Baron Race Parts Hobby Stocks rounded out AT&T Championship Night presented by Gaston Rentals as the No. 19 of Chad Pressley brought the field to the green flag for the 20-lap event. Pressley would slowly pull away from the field leaving the remaining six cars to duke it out for second. The No. 47 of Tyler McKinney worked his way towards the front breaking into the top three within the first five laps. The first and only caution fell on lap 13 after the No. 31 of Steven Willis came to a halt on the back stretch. At the restart McKinney took over the second place position while the No. 85 of division champion Jeff Weisner fell off the pace and into the back of the pack. Pressley brought the field to the checkered flag with McKinney following behind in second. The No. 28 of Casey Pierce captured a solid third place finish after falling off the pace early in the race. The No. 29 of Paul Pressley and Weisner would finalize the top five. The PASS Super Late Models are back for more action at America's Most Famous Short Track. The event will include appearances by the PASS Super Late Models, the Allison Legacy Series, the Legend cars and the Bandolaros. Grandstands open at 5 p.m. with qualifying immediately following. Racing for the Allison Legacy Series, Legends and Bandolaros will begin at 6:30 p.m., with the 150-lap Super Late Model racing schedule to begin at 8:30 p.m. For more information please visit www.proallstarseries.com. Advance Auto Parts Limiteds: No. 5 – Dexter Canipe Jr.